A witch working a magical cure on a man's foot. 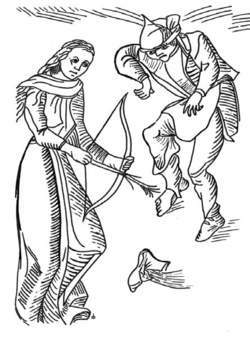 Drawing in the style of Ulrich Molitor, 1489. Courtesy Raymond Buckland. The old "Wise Ones" of the villages, from whom Wicca stemmed, were perhaps best known for their healing. Cunning men and women, pow wows, conjurers—these are but a few of the many names by which the healers were known. They had a great knowledge of herbs with which they could treat any illnesses from which their neighbors might suffer. They also, of necessity, had a knowledge of poisons, so that they could treat accidental poisoning. It was, in fact, from this knowledge of poisons that the confusion arose which led to the King James translation of the Bible to state, "Thou shalt not suffer a witch to live" (see Bible), rather than the more correct, "Thou shalt not suffer a poisoner to live." But in addition to using herbs, many of the Wise Ones worked healing magic and practiced various forms of hands-on healing. All of these types of healing are utilized by Wicca today; both by coven groups and by Solitary Witches. Healing is a most important part of Wicca, and many covens and individuals specialize in it. The first thing any Witch does before healing is gain the permission of the person to be healed. The prime axiom of Wicca is to not interfere with another's free will. Some individuals feel that if they are sick, it is for a reason and they need to experience the illness. Such a person would be averse to anyone trying to cure them. Only the individual could decide if and when it was time to seek relief. For this reason, the first step for healing Wiccans is always to obtain permission to treat from the sufferer. If at all possible, a Witch has the afflicted person actually present in the Circle while the healing takes place. It is possible to heal from a distance, but it is far better to have immediate contact. In hands-on healing by a coven, one Witch makes the contact while the others direct their power into her. This can happen from their individual positions around the circle, or they might actually make a point of physically touching the healer so that there is contact between all involved. The Witch doing the healing starts by drawing off any negativity that is present, then proceeds to direct and project positive, healing forces, including the energy from the coven. Healing may also be done by projecting healing colors (chromotherapy), and by affecting change in the sufferer's aura. Actual color may be projected using color gels, or colored precious and semiprecious stones might be laid on the body. In the late 1980s, there was great interest in crystals as amplifiers of energy, and crystals were— and are—used a great deal in healing. As a natural process, bodies select from the sunlight whatever colors are needed for balance, absorbing the vibrations of those colors. The principle of healing with color is to determine what color(s) is lacking and to provide an extra dose of that color. This can be done the aforementioned color projection, and also by absorption through drinking color-charged water. If it is not possible to have the patient present in the healing circle, then the projection of "power," whether in the form of color(s) or simply as healing energy, can be done at a distance. Burning candles is another method that may be utilized from afar to ease suffering. Candleburning magic is extremely popular, not only by Witches, but by many people, including Christians and others. The basis for this is sympathetic magic, where candles represent different objects, people, or ideas and are manipulated to influence those things. 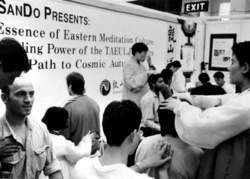 Healing demonstrations at the 1997 Festival of Mind, Body and Spirit in London. Courtesy Fortean Picture Library. There are a number of methods of healing apart from the standard medical approach. Laying-on of hands, Reiki, spiritual, herbal, magnetic, faith, auric, distant, color, and crystal are some of the types and terms used. Healing is making well someone who is ill. The method used to bring about the positive change is what varies. A psychic healer is one who has a basic desire to help those in need and who will dedicate him-or herself to that task. Bletzer suggests that “all methods of orthodox and unorthodox medicine and therapies are designed to help change the body chemistry in their particular way, making the cells normalize to make it easier for the body to heal itself.” In other words, it is the body that is healing itself; it is not a person, specific therapy, or outside power that is doing it. Fodor said of early healers, “In England the first spiritual healer, a lecturer on mesmerism, named Hardinge, became convinced through spirit communications that epilepsy was demoniac possession and undertook to cure such cases by spirit instruction. J. D. Dixon, a homeopathic doctor was the next English healer who, being converted to Spiritualism in 1857, treated his patients with prescriptions obtained by raps.” A nineteen-year-old English boy named Daniel Offord wrote prescriptions in Latin, a language of which he had no knowledge. Two months before it happened, he predicted the cholera epidemic of 1853. As an antidote he prescribed a daily dose of a half teaspoonful of carbon. In spiritual healing it is frequently the spirit of a deceased doctor or surgeon who comes through the medium to give or suggest the necessary healing. Munich-born Dr. Adolf Fritz, who died in 1918, worked through Brazilian psychic healer José Arigó. Sometimes it is the spirit guide of the medium. Gladys Osborne Leonard’s Native American guide, North Star, would work through her. What does it mean when you dream about healing? Healing in a dream often reflects a need for physical or emotional healing, the power to put right those things in the dreamer’s life that need to be cared for and made well. The outermost layer of the roof of a building. Some family members had urged us to travel to sites where charismatic preachers and healers worked miracles of healing--Toronto (site of the Toronto Blessing), a charismatic healer's ministry for family healing in Florida, a small church on the West Coast. The stumbling block of healing: we pray for God's miraculous intervention. So why are we surprised when it comes? So the first step in healing a person who has a serious illness would be to find and remove longheld emotions from past traumas. The agreement also sets aside $10 million for commemoration activities and re-mandates and funds the Aboriginal Healing Foundation at $25 million a year for the next five years to continue supporting local healing programs. They understand, interpret and mediate health and healing from an African cultural and biblical perspective. Steven Kavitky, left, and Steve Hoffman sell a CD of tonal vibrations to promote healing. Perhaps healing is more than just the absence of disease or pain. Many of them are convinced that healing is not solely the result of conventional medicine. Try as planters and their physician allies might to redefine the healing arts as free and white and masculine, it was slave women who nursed the ill, birthed the babies, and bound the wounds. Investigations are under way to test ways of accelerating the healing process, speeding re epithelialization, and decreasing the degree and duration of erythema, which would allow patients to resume normal daily activities in a timely fashion. We use everything at our disposal in an effort to prevent wounds or accelerate their healing. The study shows that the time to healing was reduced by 36%. They are, for example, wisdom, healing, miracles, prophecy, discernment of spirits, and speaking in tongues.